St. John Chrysostom: After the sin comes the shame; courage follows repentance. This entry was posted in Sayings from Saints, Elders, and Fathers, St. John Chrysostom and tagged Natural Order, Repentance, Shame, Sin, The Evil One on December 15, 2015 by ocqadmin. St. Isaac the Syrian: The fact that a man slips into accidental sins . . . 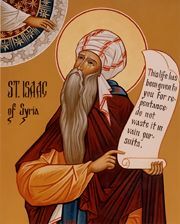 This entry was posted in Sayings from Saints, Elders, and Fathers, St. Isaac the Syrian and tagged Awareness of Sin, Conscience, Human Nature, Overcoming Sin/Passions, Passions, Shame, Sins, Soul, Spiritual Illness, Spiritual Waking on June 27, 2015 by ocqadmin. St. John Chrysostom: . . . the vile state of a house is not in vessels lying in disorder, nor in an untidy bed, nor in walls covered with smoke, but in the wickedness of them that dwell therein. . . . But oh! foolish men; who do even curse the poor, and say that both houses and living are disgraced by poverty, confounding all things. For what is a disgrace to a house? I pray thee. It hath no couch of ivory, nor silver vessels, but all of earthenware and wood. Nay, this is the greatest glory and distinction to a house. For to be indifferent about worldly things, often occasions all a man’s leisure to be spent in the care of his soul. When therefore thou seest great care about outward things, then be ashamed at the great unseemliness. For the houses of them that are rich most of all want seemliness. For when thou seest tables covered with hangings, and couches inlaid with silver, much as in the theatre, much as in the display of the stage, what can be equal to this unseemliness? For what kind of house is most like the stage, and the things on the stage? The rich man’s or the poor man’s? Is it not quite plain that it is the rich man’s? This therefore is full of unseemliness. What kind of house is most like Paul’s, or Abraham’s? It is quite evident that it is the poor man’s. This therefore is most adorned, and to be approved. And that thou mayest learn that this is, above all, a house’s adorning, enter into the house of Zacchaeus, and learn, when Christ was on the point of entering therein, how Zacchaeus adorned it. For he did not run to his neighbors begging curtains, and seats, and chairs made of ivory, neither did he bring forth from his closets Laconian hangings; but he adorned it with an adorning suitable to Christ. What was this? “The half of my goods I will give,” he saith, “to the poor; and whomsoever I have robbed, I will restore fourfold” (Luke xix. 8). On this wise let us too adorn our houses, that Christ may enter in unto us also. These are the fair curtains, these are wrought in Heaven, they are woven there. Where these are, there is also the King of Heaven. But if thou adorn it in another way, thou art inviting the devil and his company. He came also into the house of the publican Matthew. What then did this man also do? He first adorned himself by his readiness, and by his leaving all, and following Christ. So also Cornelius adorned his house with prayers and alms; wherefore even unto this day it shines above the very palace. For the vile state of a house is not in vessels lying in disorder, nor in an untidy bed, nor in walls covered with smoke, but in the wickedness of them that dwell therein. And Christ showeth it, for into such a house, if the inhabitant be virtuous, He is not ashamed to enter; but into that other, though it have a golden roof, He will never enter. So that while this one is more gorgeous than the palace, receiving the Lord of all, that with its golden roof and columns is like filthy drains and sewers, for it contains the vessels of the devil. This entry was posted in Sayings from Saints, Elders, and Fathers, St. John Chrysostom and tagged Apostle Matthew, Apostle Paul, Cornelius, God as King, Kingdom of Heaven, Material World, Outward Appearances, Patriarch Abraham, Poor, Poverty, Restitution, Shame, Soul, Spiritual, Spiritual Life, The Evil One, The Wealthy and Rich, Wealth and Riches, Worldliness, Zacchaeus on February 2, 2014 by ocqadmin. St. Cyril of Jerusalem: Let us then not be ashamed to confess the Crucified. . . .
Read on Kindle. No Kindle? Try the free reader for your phone, tablet, or computer! This entry was posted in Sayings from Saints, Elders, and Fathers, St. Cyril of Jerusalem and tagged Cross, Living Orthodoxy, Shame, Sign of Cross on October 23, 2013 by ocqadmin. St. Gennadius of Constantinople: Seek the simplest in all things . . . This entry was posted in Sayings from Saints, Elders, and Fathers, St. Gennadius of Constantinople and tagged Humility, Poverty, Shame, Simplicity on July 13, 2013 by . This entry was posted in Sayings from Saints, Elders, and Fathers, St. Gennadius of Constantinople and tagged Conquering Evil, Defilement, Despair, Drunkenness, Falling Down Getting Up, Humility, Light and Darkness, Pride, Purity, Repentance, Shame, Sin, Sobriety on July 12, 2013 by .